Are Above Ground Pools Easy to Install? Posted on October 4, 2018 , in Above Ground Pools. For many, the idea of above ground pools bring them visions of relaxation and luxury. They may dream of long afternoons sipping drinks and cooling off in the clear waters. However, the process of installing an above ground pool can quickly make you forget about some of these dreams. Installing an above ground pool does not need to be complex. In fact, it can be rather simple as long as you follow some basic instructions and tips. When deciding on where to best install your pool, check your local building codes for any possible restrictions. This can vary from location to location, so it is best you start your research there. You will also want to consider any sort of plumbing or electric cables in the area. Make sure they are a safe distance from your pool that allows for children to safely play and alternative weather to not disrupt the integrity of your pool. It is also a good idea to choose a spot that is not too hidden. This way when children or pets are playing in or around the pool, adults can easily keep a close eye from nearby. It is important to consider any trees or shrubs in the area that may cause your pool to become dirty easily. A tree overhead can easily force you to spend a lot of time cleaning it. 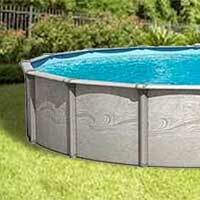 Lastly, the spot you choose for your above ground pool should be flat. An above ground pool on a slope or hill can allow for the water to be unevenly distributed. This uneven distribution can cause strain on the structure of the pool and deterioration at a much faster rate. When setting up your pool it is very important to include a pump and filter. This will help keep the water clean throughout its use. Your user manual should provide you with some information as to the best pump and filter to purchase, but a local dealer can give you some advice as well. Worse case scenario, go for a slightly larger pump and filter than suggested. It will keep your pool especially clean. When it comes to the type of water you want to use, chlorine or salt are both options. There are pros and cons to each and salt is gaining in popularity, but most swimming pools use chlorine. No matter what type of pool you go with, there will be some sort of maintenance involved. This includes adjusting the pH and chlorine to sale levels on a regular basis. You should also make sure there is a sufficient amount of water in your pool. In addition to these cleaners, things like a skimmer and vacuum may be needed to help keep all parts of your pool clean. These can help make sure the bottom of your pool is always squeaky clean. If you began this article wondering, are above ground pools easy to install? We hope you have been given some clarity on the subject and feel confident installing your above ground pool. There are a few components that are absolutely necessary for making sure you are providing a safe and clean environment for all swimmers, but it can be fairly easy to get a handle of. To find out more about above ground pool installation, download a buyer’s guide.